It’s the 15th again…okay, yesterday. But, I’m close! It’s time for my Dueling Darlings post and Team Diva was sent by Barb this month. The chosen theme she and her partner in craft came up with is April Showers (love!!) and she sent a Whipper Snapper Design, Umbrella and Slicker for us to play with. This is a 5×7 card. Bigger than I usually make, but I need to send some photos to someone and wanted a larger card! Thanks for a great kit, Barb! I’ll see you next month. 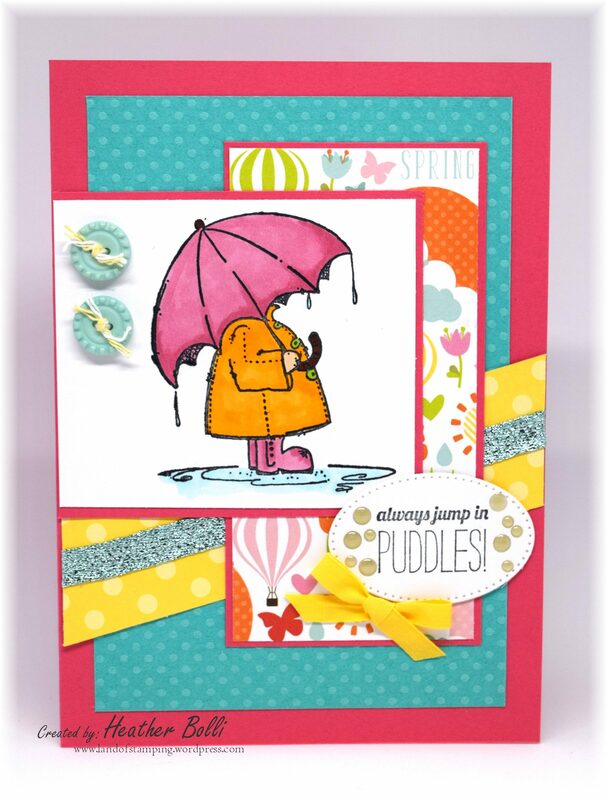 Such a colorful and cute card, Heather! I love all the layers, Heather. Really a cute design and lots of fun paper. Great color combination too! This card is stunning! I really love the layout and the colors are perfect with the paper!